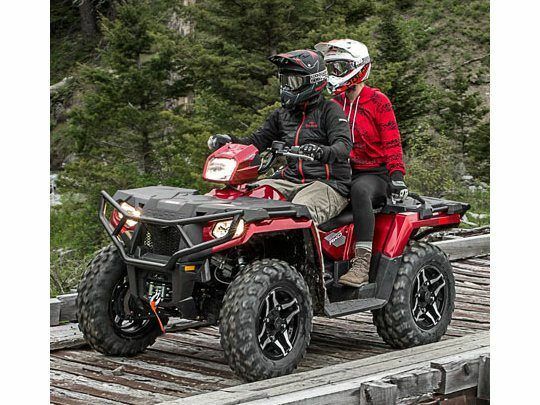 Designed to work flawlessly with our EPS system, the double A-Arm front suspension tracks true and provides 8.25” of travel to smooth out the roughest trail. Powerful ProStar® 44 HP Performance Now with 22% more horsepower (44 hp) and featuring Electronic Fuel Injection (EFI) and Dual Overhead Cams with 4 valves per cylinder, the 570 starts flawlessly and runs smoothly. 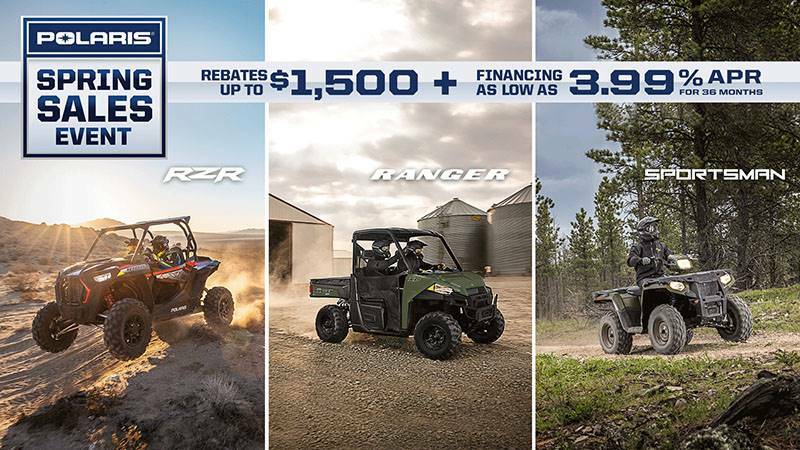 High Performance Close Ration On-Demand AWD The best just got better, the high-performance close ratio AWD system engages all four tires faster than ever when you need more traction. 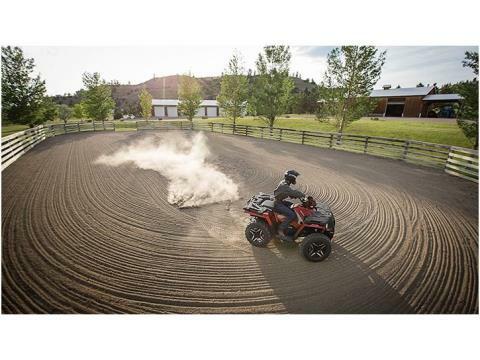 Works with the EPS system to provide Sportsman signature handling and reverts back to 2WD when you’re back on solid ground. Industry exclusive Lock & Ride® / Steel Rear Rack Redesigned rear rack features durable steel construction and Lock & Ride® technology to make it easy to carry and secure gear. Maximum Headlight Power and Built to Run Accessories Two lights are located in the front bumper and one mounted in the handlebar pod. Maximize your lighting with the ability to have all three on at once for 150 W of power. 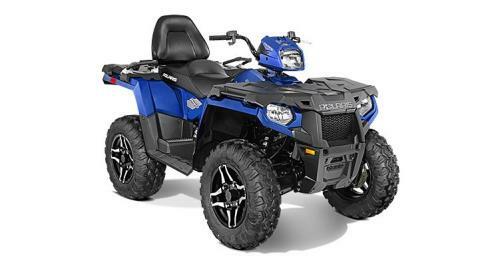 660 watt alternator for more charging power and the capability to operate more hardest working Polaris accessories. Paint 5-Layer metallic automotive-style finish is 9 times more scratch-resistant than standard plastic. Integrated Front Storage The most integrated storage of any ATV. The 6.5 gallon capacity lets you stow-away loads of gear and still have access to it, even with items tied to the deck. The front of the seat and side panels have been narrowed at the thigh by 3.25". Coupled with wider and longer floor boards, the new layout is more comfortable and makes it easier to mount and dismount the ATV. 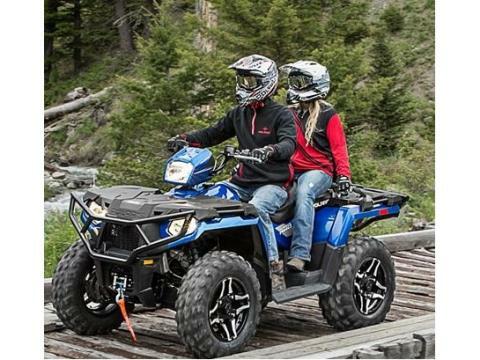 The ultra-comfortable all-new one-piece seat design and backrest are fully padded and contoured for full support, with a slightly raised position so you can see down the trail. Two lights are located in the front bumper and one mounted in the handlebar pod. Maximize your lighting with the ability to have all three on at once for 150 W of power. 660 watt alternator for more charging power and the capability to operate more hardest working Polaris accessories. 5-Layer metallic automotive-style finish is 9 times more scratch-resistant than standard plastic. Improved Driver and passenger comfort The front of the seat and side panels have been narrowed at the thigh by 3.25". Coupled with wider and longer floor boards, the new layout is more comfortable and makes it easier to mount and dismount the ATV. The ultra-comfortable all-new one-piece seat design and backrest are fully padded and contoured for full support, with a slightly raised position so you can see down the trail. High Ground Clearance A full 11" of obstacle-clearing ground clearance lets you tackle some of the tougher terrain that comes your way. 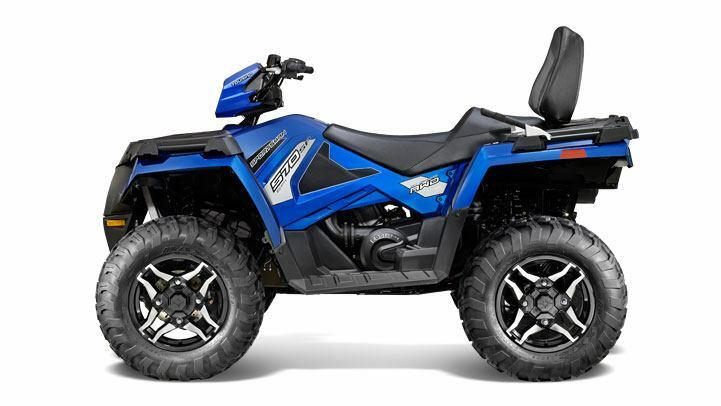 Legendary smooth independent rear suspension (IRS) The Sportsman was the world’s first ATV with IRS, a feature that made it as popular as it is today. Its rock-solid design has 9.5" of travel to minimize body roll and keep the ride smooth. Electronic power steering (EPS) The smoothest, most responsive power steering available, with 30% more power assist than the leading competitor, plus Variable Assist for easier steering at lower speeds. Our EPS lets you ride all day with less fatigue from steering. 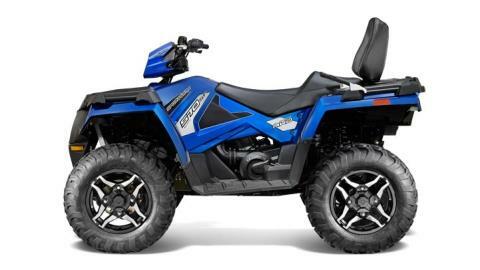 Double A-Arm front suspension Designed to work flawlessly with our EPS system, the double A-Arm front suspension tracks true and provides 8.25” of travel to smooth out the roughest trail. Supreme vehicle control with ADC AND EBS Active Descent Control (ADC) and Engine Braking System (EBS) work together to control downhill braking to give you optimum control and smooth, even deceleration during descents.